The above badges represent the current development branch. As a rule, I don't push to GitHub unless tests, coverage and usability are acceptable. This may not be true for short periods of time; on holiday, need code for some other downstream project etc. If you need stable code, use a tagged version. Read 'Further Documentation' and 'Installation'. In my research of the Scala language, I came across the For Comprehension. It turns out that at its core, it is really a variant of a classic Builder Pattern, but without the associated requirements for a Director. I did some searching but couldn't find anything remotely like it, so if you know of anything please do let me know. So why is it useful? In essence it provides a mechanism to collect together things and then assemble them at some later point. The things in this case are functions. Since the introduction of Callables (or Closures) in PHP, life has changed a bit for the PHP dev. The anonymous function gives a freedom to do anything (PHP has always had that,) in a much simpler way. The examples/OneManCoffeeShop.php script gives a flavour of the Assembler in action in a relatively simple scenario. examples/CarAssemblyLine.php is a bit more complex, but shows how you can pass around an Assembler to various processes a bit like a shopping trolley, leaving it until some point in the future where it is all assembled into some final product. It also demonstrates a simple derivation of the Assembler, the Scala like For Comprehension which because For is a reserved word in PHP, is called FFor. In a large system, you might want to use an Assembler as a collection point for stuff going on in the application. For this purpose you can get a Singleton instance via Assembler::get(). Of course, you can only use this once (as in subsequent calls to Assembler::get() will return the same instance,) so use with care. At this point, the entries become immutable and cannot be overwritten. You can continue to add additional entries, perhaps referencing earlier ones and then call ->assemble() again to fix the entries. Releasing multiple items will return an array of values, so perhaps the easiest way to access them is to use the venerable PHP list() method, e.g. 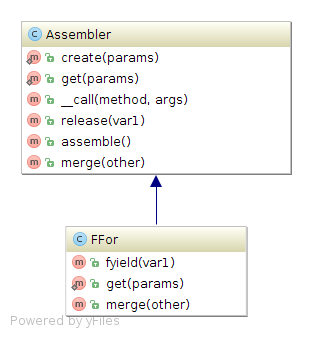 You can send in parameters during the creation (create() or get()) of an Assembler. This is most useful to prevent you having to use the use clause during function definition. Parameters sent in during the create process are immutable, i.e. you cannot override them with a later declaration. You can utilise the ParameterGrabable trait to facilitate parameter injection into the create() constructor. you cannot merge() a FFor. See the examples/CarAssemblyLine.php script for a usage example. Please note that what you are seeing of this documentation displayed on Github is always the latest dev-master. The features it describes may not be in a released version yet. Please check the documentation of the version you Compose in, or download. See the tests and Test Contract for further information. Although the library itself does not have any other dependencies other than PHP5.4+, the examples do. These are included in the composer requires-dev statement so as long as you have included the dev requirements (default for Composer,) you should be good to go. Found a bug you can't figure out? Or - raise an issue ticket.